President Barack Obama called out Dartmouth fellow Jamila Mayanja from a crowd of hundreds of young African leaders at a summit for the president’s Washington Mandela Fellowship program Monday, sharing a laugh with the Ugandan entrepreneur. 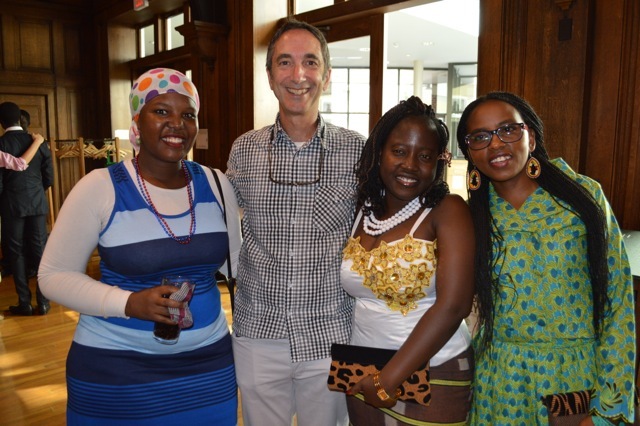 Mayanja was at Dartmouth for the month of July as one of 25 fellows from the Young African Leaders Initiative, an Obama administration program that brings some 500 innovators from across Africa to develop business, leadership, and networking skills at U.S. colleges and businesses. When Obama recognized Mayanja for her work founding a socially conscious business, a cheer went up from the crowd. Mayanja jumped to her feet smiling, hands on hips, and greeted the president. “She hopes to take what she learned during her time at Dartmouth University to meet her goal of getting 1,000 youth to work in or run their own business, so we’re proud to be your partner,” the president said. She said the event was the culmination of an exceptional experience developing her leadership and entrepreneurial skills in the Dartmouth program led by the John Sloan Dickey Center for International Understanding. “I benefitted very much from the training in design thinking, business development, and leadership skills at Dartmouth, which I will take back to Uganda and share,” she said. She said the workshops by Rich Nadworny ’82 in the DEN Innovation Center and New Venture Incubator were invaluable for her thinking about her business, and she noted that Nadworny, director of entrepreneurship and innovation for the Dartmouth YALI program, took time to work with her to think about how to share new ideas with the Ugandan youth she works with. The YALI Business and Entrepreneurship Institute at Dartmouth is a collaboration of the John Sloan Dickey Center for International Understanding, Nelson A. Rockefeller Center for Public Policy and the Social Sciences, William Jewett Tucker Foundation, Thayer School of Engineering, The Outdoor Programs Office, and the Office of Entrepreneurship and Technology Transfer.